“Smart friends, funny friends”—just two of the many types of friends displayed in excellent photos and simple text. Whether working alone or with frequent collaborator Kelly, Rotner specializes in photographic albums that explore basic concepts, and she has a great capacity for capturing animated children in many situations. The racially diverse kids (and even a few animal friends) in these color photos, arranged in varied layouts and often on bright backgrounds, invite multiple viewings. Youngsters and adults will enjoy the activities, emotions, and infectious smiles. Disabled children are included in a double-page spread captioned: “Friends with different ways to walk. 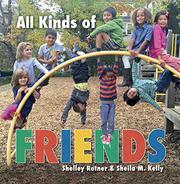 Friends with different ways to talk.” On the left, one boy walks and another travels in his electric wheelchair. The opposite photo focuses on a boy and an older girl using sign language. It is a pity that disabled children are not more fully integrated into the whole. Gender equality (implied by hairstyle and attire) is given some attention, as in one double-page spread captioned: “Friends who like to dress up and friends who like to pretend.” Two young white boys wear colorful capes; two fairy princesses, one black and one white, wear jeweled tiaras and sport pink and purple wings; and an Asian boy and girl play with plastic dinosaurs.